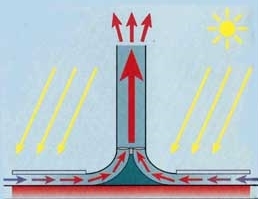 The principle of the solar updraft tower is as simple as the fact that heat rises. Even the basic configuration of a solar updraft "chimney" is simple. The tower stands at the center of huge plastic sheet that's supported several feet off the ground on posts. As the sun shines down on the plastic -- the "greenhouse" -- the air beneath it heats up rapidly and looks for a place to escape. The only outlet is through the narrow tower in the center. The air rises into turbines that drive generators, producing electricity but no greenhouse gases. One particular charm of the updraft tower is that it even works at night, as well as on cloudy days and periods of rain, making it the most efficient of available wind-power sources. This efficiency depends on the difference between the temperature under the material and the temperature at the top of the tower – the greater the differential, the faster the air will rise. During the day, the heat beneath the material reaches about 50 degrees C, warming the ground as well as the air. At night, the air is cooler at the top of the tower than it was during the day, but the ground, still radiating stored heat, keeps the air warm enough to create a temperature differential that's more than sufficient to send warm air upward and drive the turbines. The amount of energy that the tower produces -- day or night -- is proportional to the area of material and the height of the tower – the larger the greenhouse and the taller the tower, the greater the energy will be. Currently, no solar updraft towers are in use commercially. But in 1982, engineers in Manzanares, Spain, built a 650-foot prototype tower with a surrounding greenhouse that covered nearly 11 acres. The facility generated an average of 50 MW and ran for approximately 15,000 hours until it collapsed 1989 -- structural integrity is the Achilles heel of these towers. They must withstand winds that are significantly higher at the top than they are at the bottom, causing stress differentials that warp and weaken the structure. Despite its unfortunate end, the tower had a successful run that caught power companies' attention. About that time, oil prices began to drop, and people’s enthusiasm for solar updraft technology waned. But things have changed -- today's rising oil prices have rekindled interest. The Australian government has designed its own tower and will soon begin construction of version 400 feet in diameter and 3,000 feet high, which would make it the tallest man-made structure in the world -- more than twice the height of Malaysia's Petronas Towers, or the Canadian National tower in Toronto. The greenhouse will cover a circle with a diameter of 11 square miles. The engineers plan to use reinforced high-tensile concrete to construct the tower -- only time will tell if they've found a solution to the stresses it will have to endure. Transparent plastic with heat-enhancing properties will keep the temperature of the air beneath the greenhouse between 35 degrees C at the perimeter to about 70 degrees C in the middle; these temperatures will amplify the differential between ground level and the chimney top. The air, once it enters the tower, will climb at about 35 mph, losing about 1 degree C for every 300 feet it travels -- a ratio that engineers consider ideal to reach peak wattage. If the tower works as engineers hope, it will generate about 200 MW – enough to power about 200,000 Australian homes, or around 47,000 U.S. homes. Generating that much energy with fossil fuels would produce about 830,000 tons of CO2 per year. 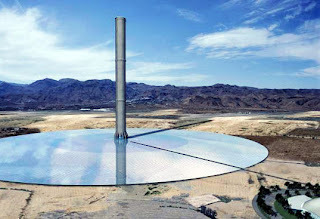 So the solar updraft tower, which emits no greenhouse gases, will be a popular option for advocates of green technology. The interiors of updraft towers, as well as the space beneath the greenhouse, will be hospitable enough to allow maintenance crews to work while the facility is operating -- a completely different maintenance model for power plants that must either cut back on their power production or, in the case of nuclear facilities, shut down entirely for servicing. Solar updraft towers appear to be one of the better ways to tap the inexhaustible energy of the sun. The technology to build them is available. All that's needed is the political will and the money to build them -- these towers are expensive, but analysts say that investors would recoup their investments in two to three years. Would you want a wind farm in your town?